Please check our Events page for upcoming live education and practice management opportunities. Interested in speaking at an IAFP meeting? Click here. Beginning July 1, 2019, each physician or osteopathic physician renewing their controlled substances registration will need to have completed two (2) hours of continuing education in the topic of opioid prescribing and opioid abuse. Licensees will not need to submit certificates of completion. Instead, they will attest on their renewal form that the hours have been completed. The Medical Licensing Board may then audit up to 10% of licensees to ensure compliance. Licensees should retain their certificates of completion for up to 3 years from the date of renewal. IAFP members who watch both activities below will meet the opioid education requirements and we can supply a certificate upon request. Email us for your certificate or call (317) 237-4237. 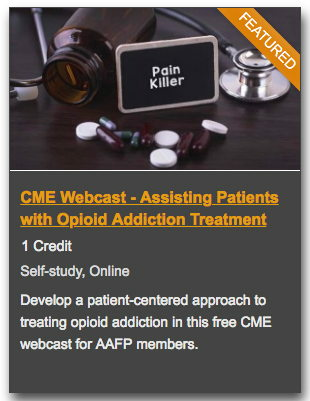 Members may watch this free webcast to develop a patient-centered approach to treating opioid addiction and earn 1 AAFP Prescribed credit. This activity is free for AAFP members. Outline the problems associated with opioids, including addiction. Outline nonpharmacologic and pharmacologic approaches to opioid addiction, including the FDA-approved medications methadone, buprenorphine, and naltrexone. Consider the benefits and challenges of becoming an FDA-waived physician for medication-assisted treatment of opioid addiction. Develop a patient-centered approach to the patient with opioid addiction. A new law will took effect on Tuesday, January 1, 2019, requiring prescribers of controlled substances in Indiana to register with INSPECT, Indiana’s prescription drug monitoring program. The new law applies to all Indiana prescribers holding a controlled substance license. However, if your health care facility has integrated its electronic health records (EHRs) with INSPECT, you are already registered and do not need to do anything more. Click here to learn more about registering for INSPECT. The Richard M. Fairbanks School of Public Health ECHO Center at IUPUI provides specialty education and training to primary care providers interested in treating their patients with complex and chronic conditions, building their capacity to offer high quality, best-practice care locally. The Fairbanks School of Public Health ECHO Center at IUPUI currently hosts two ECHO programs with several new ECHO projects launching in 2019. This clinic's goal is to provide case-based education and mentorship in the clinical management of substance use disorders (SUDs) in youth, in order to build capacity for delivery of high quality best-practice care. Indiana University School of Medicine has been contracted by Indiana's Family and Social Services Agency to provide this service, free of charge to participating providers. Registration can be found on their website. November 28, 2017 - The Highlight on VACCINATIONS 4 TEENS Resource Library was developed to help you and your care teams educate teen patients and their families about the importance of receiving Centers for Disease Control and Prevention (CDC)-recommended vaccinations. The materials were just updated to reflect new national teen vaccination statistics. 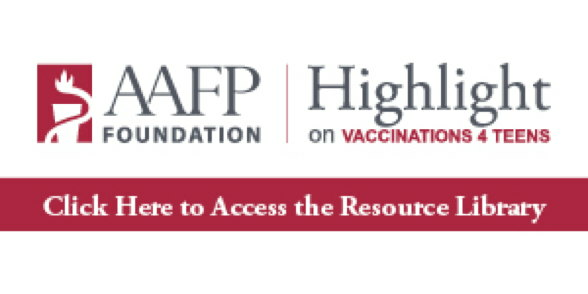 Access the Resource Library – which includes appointment reminders, videos, posters and more – at www.aafpfoundation.org/vaccinations4teens. 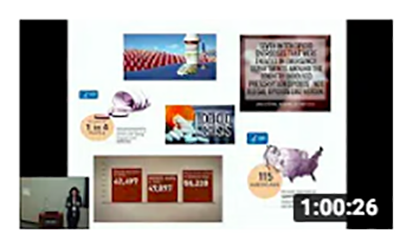 The Medicare Access and CHIP Reauthorization Act of 2015 (MACRA) passed by an overwhelming bipartisan majority in Congress and was signed into law by President Barack Obama on April 16, 2015. Visit the AAFP's website for information and resources relating to this legislation, including a 60-second overview; a three part series including a big picture overview, preparation guide and tips on maximizing payments; important dates; acronyms; and a readiness assessment tool! 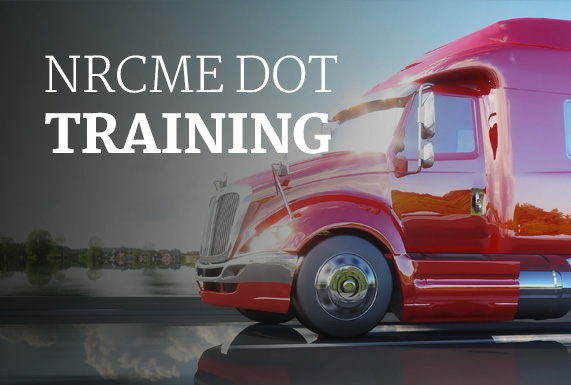 On-Demand DOT Training Available Now! May 21, 2014 was the deadline by which physicians who wish to examine commercial drivers must be listed on the National Registry of Certified Medical Examiners (National Registry), a new Federal Motor Carrier Safety Administration (FMCSA) program. Only medical examiners that have completed training and successfully passed a test on FMCSA's physical qualification standards will be listed on the National Registry. We are working with the Iowa AFP to offer you on-demand online training that will prepare you to take the test. Find out more and register now. AAFP CME Records & Reporting - AAFP members can view their CME record and report their CME on this interactive section of the AAFP website. CME Center - Search the AAFP website for live CME courses at a time and location convenient for you. You may search by date and/or location for courses in the next 12 months. AAFP CME - Prepare for your boards, maintain certification, or enhance your clinical skills with family medicine CME produced by the AAFP. ABFM Initial Certification - Candidates seeking certification must meet the eligibility criteria specified by the ABFM. Maintenance of Certification - The ABFM MC-FP service is the means by which the ABFM continually assesses Diplomates. On July 6, 2015, CMS announced a concession in the transition from ICD-9 to ICD-10. The announcement states that for one year past the October 1, 2015 deadline, CMS will not deny payments to doctors because they didn't use a sufficiently specific ICD-10 code after the new code set is implemented. Additionally, CMS said that providers will be able to apply for advance payment in the event that Medicare Part B contractors aren't able to process claims because of ICD-10 implementation. CMS also announced the creation of an ICD-10 Ombudsman and various online resources and guidance to aid the medical community in the transition. The AAFP has ICD-10 resources on its website. CMS’ free help includes the “Road to 10” aimed specifically at smaller physician practices with primers for clinical documentation, clinical scenarios, and other specialty-specific resources to help with implementation. CMS also has more resources available here. The Indiana POST Program is an advance care planning tool that helps ensure treatment preferences are honored. It is designed for patients with serious illness. Preferences for life sustaining treatments including resuscitation, medical interventions (e.g., comfort care, hospitalization, intubation, mechanical ventilation), antibiotics, and artificial nutrition are documented as medical orders on the POST form. It must be reviewed and signed by a physician to be activated. This form transfers throughout the health care system and the orders are valid in all settings. Click here to visit the POST website where you can download the form, watch a video presentation, and find out more information. The Indiana State Department of Health also has resources and forms available at its Advance Directives Resource Center page. The Promoting Smokefree Pregnancies in Indiana Toolkit is now available. This resource, designed for direct service providers and community partners, is the culmination of extensive research about what works to reduce prenatal tobacco smoke exposure. It includes practical ideas that can be implemented in a number of settings by professionals in many different roles. Click here for more information. Check your member email newsletter, IAFP Today, for ongoing updates, links, and resources. The death certificate law passed in 2011 continues to be the subject of questions from members. To be of assistance the IAFP compiled a review of the statutes on death certificates to help remind members of their duties. Click here to read it now.